When you install a metal roof on your home, chances are good that it will be the last roof you ever install. A metal roof provides unmatched durability, lasting 2 to 3 times longer than asphalt roofing. Today’s metal roofing shingles are designed to look like traditional materials such as asphalt shingle, clay tile, cedar shake and slate. 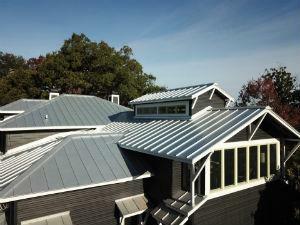 Premier Roofing and Contracting offers a wide variety of metal roofing styles and colors to match your home. If you’re interested in replacing your current roof, call us at 1-844-656-9641 or click the button below to schedule a free roofing estimate today. We provide a free estimate in San Antonio, New Braunfels, Universal City and throughout Texas. Long warranties: Most metal roofing comes with a 30 to 50 year warranty, depending on the manufacturer. Contact Premier Roofing and Contracting to learn more about the metal roofing products we install and the warranties provided. The cost of your metal roof depends on the style of roofing and your home’s pitch. If you’re interested in a metal roofing system, contact us to request a no-obligation consultation and we will provide you with a free estimate for professional installation. Trust the experts at Premier Roofing and Contracting for all your roof replacement and roof repair and maintenance needs in Helotes, Leon Valley, Alamo Heights, Cibolo, Converse, Universal City, Schertz.